Can You Do Cardio Exercise Every Day? Jody Braverman received a Bachelor of Arts in English Literature from the University of Maryland and personal trainer certification from the National Academy of Sports Medicine. She is also a certified fitness nutrition specialist (NASM) and a certified yoga teacher (YogaWorks). Lisa is a retired personal trainer with more than 4,000 hours of hands-on experience working with a variety of clients, from sports teams to weight loss and post-rehab populations. She's also a professional writer. Published credits in the health field include Feel Rich, SheKnows, Precor.com, and the East Coast magazine Breathe. When it comes to exercise, more is always better, right? That's true up to a point, and for most people there's no problem with doing some sort of cardio exercise every day. In fact, numerous experts, including those at the Mayo Clinic, recommend that you do exactly that, aiming for around 30 minutes of cardio exercise every day to help keep your body healthy. With that said, if you start experiencing the symptoms of overtraining, it's time to dial things back. As a general rule, yes, you can do cardio every day, although unless you're a competitive athlete or under a doctor's orders, you can be more flexible about how you schedule your exercise. However, be alert to signs of overtraining that indicate you should dial back your fitness routine. Finding the right amount of cardiovascular exercise for you means balancing not just quantity but quality — or to put it more precisely, intensity — too. Although expert recommendations vary a little bit, they're all in the same general ballpark, and the gold standard at the national level is the Department of Health and Human Services Physical Activity Guidelines for Americans. According to those guidelines, to maintain good health, adults should get at least 150 minutes of moderate-intensity cardiovascular exercise per week, or 75 minutes of vigorous-intensity cardio per week. If you can bump up to double that amount — 300 minutes of moderate cardio or 150 minutes of vigorous cardio per week — you'll enjoy even greater health benefits. If you notice, the expert guidelines for cardio usually come by the week, not by the day. So it's up to you to decide how to divide up those minutes of cardio workout. Let's say you're going for 300 minutes of moderate cardio per week; that's five hours, which most people wouldn't even think of doing in one day. 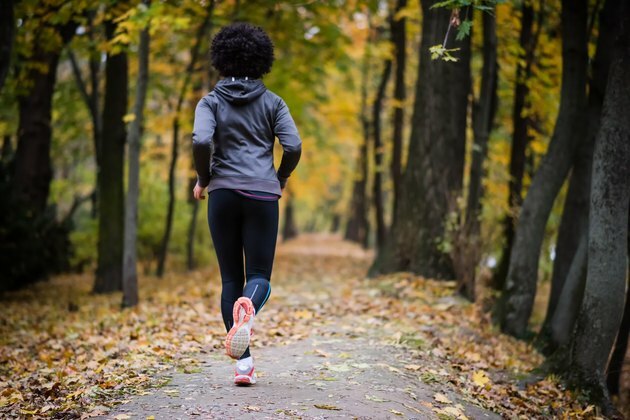 But if you're an avid runner, hiker or cyclist, you could knock out those five hours in three or four long outings during the week. Or if you're a Zumba enthusiast, several days of doubling up on Zumba classes is all it would take to meet the guidelines for the week. If you'd rather hit the treadmill or elliptical trainer in the gym every day, you could spend just over 40 minutes of each session doing cardio and still meet that healthy goal. The bottom line is that choosing a workout schedule that works for you — so you're able to actually keep it up and ideally even enjoy it too — is more important for your health than being in the gym every single day. Let's say that you do find yourself hitting a cardio workout every day, whether that's because sweat is your happy place or you're training to meet an athletic goal, or you just set a new fitness goal and wanted to really start with a bang. Make sure you're alert to the signs and symptoms of overtraining, which can come because you've worked out past the "tipping point" where exercise starts doing more harm than good. If you are overtraining, it's time to dial it back and, if necessary, seek help from a medical professional to address your symptoms. You might also benefit from a little time with a coach or trainer, who can help you set up a periodized training program, which basically means finding the right balance of exertion, active recovery and complete rest to simultaneously reach your fitness goals and stay healthy. Overuse injuries are another problem that can strike if you work out so frequently that your body can't recover between bouts. They also crop up if you're using incorrect form, whether for cardio workouts like running or for weightlifting exercises. Obviously, using correct form and allowing yourself adequate recovery time are the two key factors for avoiding overuse injuries. But you can stack the deck even more in your favor by cross-training, or engaging in more than one type of workout, so that your body isn't going through the exact same set of movements every time you break a sweat. That could mean mixing up your running with inline skating, or occasionally ditching the treadmill for circuit training. You get the idea: Just mix it up. Aside from reducing your risk of injury from constant repetitive motion, cross-training can also help you avoid the muscular imbalances that sometimes crop up if your workouts emphasize certain muscles in the body but neglect others. Cardiovascular exercise is often treated as a silver bullet for weight loss, and it is certainly very effective. For example, if you weigh 185 pounds, then numbers from Harvard Health Publishing peg your calorie burn for a half-hour of swimming vigorous laps or jogging at 6 mph at 444 calories. That's 444 calories in just 30 minutes — which, depending on your nutrition habits, could position you with the right calorie deficit to lose a pound a week or more. A "calorie deficit" means you're burning more calories than you take in; it's the key to losing weight, because your body uses stored fat to provide that extra energy. But don't get so focused on the weight-loss prize that you run yourself into the ground; long-term weight loss is all about making lifestyle changes that you can stick with for the long term. Try to give yourself one full rest day a week at a minimum. If you're just starting out you might need more rest, although you can gradually increase the frequency of your workouts as your body adapts, which will happen faster than you may expect. Don't be afraid to work weight-training into your fitness routine, too. Not only will it give you a break from the repetitive motion of your cardio workouts, it'll also help you build lean muscle mass that boosts your metabolism, speeds weight loss, and creates a pleasing shape that will be revealed as you slim down. Mayo Clinic: How Much Should the Average Adult Exercise Every Day? How Often Should You Work Out in a Gym? What Are the Average Miles You Ride in a 60 Minute Spin Class?